Great set for both beginners and those looking to expand their throwing weapon collection. 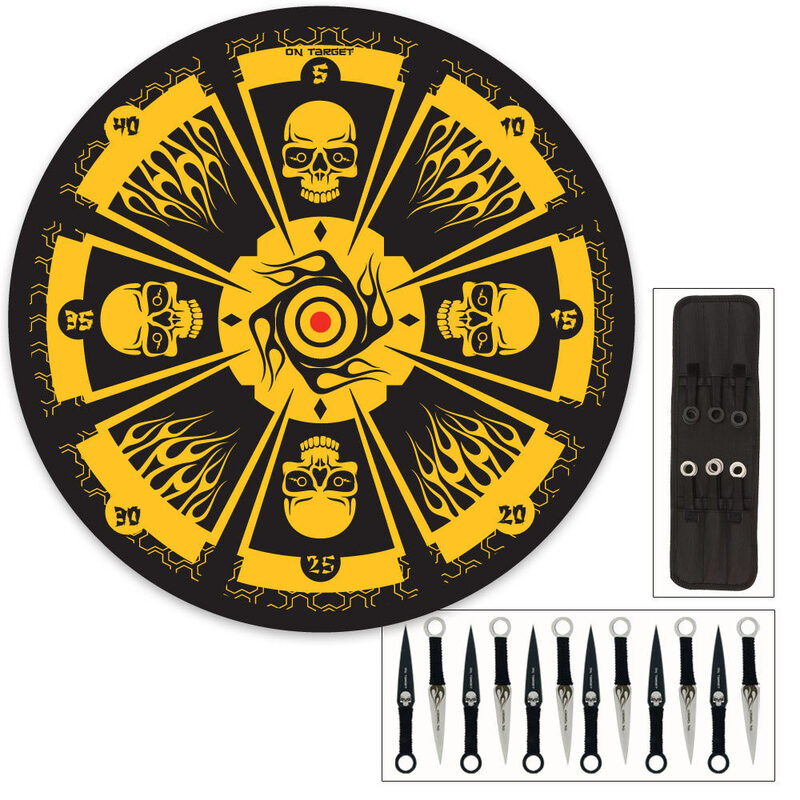 This package deal includes 12 throwing knives plus target board. Each thrower is 6 1/4 in. overall and made of stainless steel with a black cord wrapped handle. Half of the knives are finished in black with skull etching, while the other half have a silver satin finish with flame etching. A nylon sheath is included for easy knife storage and transport. The enclosed 3 x 4 in. paper flyer lists several knife throwing games to keep you and your friends entertained and throwing for hours. The throwing knives were fine except for the nylon cording around the handles. Can unravel. The target board I don't suggest getting. It's just made of layered paper wrapping around in rings. It was falling apart when I opened the box. Nothing is holding all these rings of paper together. Glue would have been good to use while making the board. Had to through board away first day. Sweet SET!!! the knives come sharp, balanced and are very easy to throw. The board that it comes with is ok... due to the fact that it needs a hose-clamp to keep it from falling apart. Overall very impressed with this set...... in fact i'm ordering a few of them for my brothers!! I received this set as a Christmas gift and I absolutely love it!! The knives are perfect size and weight for my everyday throwing. The string wrap around the handles came off in a day, but if you burn the string end that will do the trick. I LOVE BUDK!!!! a bit smalller then i expected but probably my mistake for not reading the description. They are nice, HAND CRAFTED, nicely balanced and good for practicing. Like the previous comment said the cord does come off easily but they are as good without it as they are with it so not a big of a deal. Also the previous comment said that the target almost broke after he hit it 10 times, not true at least in my case i've been throwing knives at it for about 20 minutes now and it's pretty good, soft wood so it gets nasty pretty fast but still useable. Great buy worth a price i recommend it! Thanks to true swords once again for awesome products and great prices. When I got these knives I was super excited, but the only draw back was the board was super thin. I think it's great for someone who is getting into throwing knives, but for the more experienced thrower you will destroy the target board in two or three hit unless it has a solid board behind it. Other than that the knives are great and they have a very fine point to them. The Kunai knives themselves are great. They're nicely balanced and they're great for throwing. Unfortunately the black chord wrapped around the knife comes off rather easily. And the target board it comes with is rather weak. I pretty much almost broke the damn thing after being hit about 10 times with the knives. But again the Kunai knives themseves are great, they're nice and sharp.